Fall is my favorite season. In Texas, it may technically be Fall, but it sure doesn’t feel like it. All you see when you go out are shorts, flip flops and tank tops. I’m impatiently waiting to bust out the boots and jeans. To me, when I can put on a nice top, a pair of jeans and my cowgirls, then it is officially Fall! It’s a magical time. I’m weird in that I do NOT go crazy over pumpkin everything. I have a few ceramic ones that I decorate the house with, but other than that, I’m not into the put pumpkin in everything mania that grips most women this time of year. But I do have my favorite things that I look forward to every year. ~Reading on my porch swing. All wrapped up in a blanket. The best part of that when it’s chilly? NO dang bugs! ~Football. The air just seems charged during football season. We live in a small town, so you hear/read/see everything about our high school football team. The paper always has at least a couple of pages dedicated to them and all the businesses have Good Luck Pirates! Or Go Pirates on their signs. Friday Night Lights=pure excitement. College games on Saturday and Dallas Cowboy games on Sunday. Yep, it’s football fever. Makes me think of wrapping up in blankets while sipping hot chocolate sitting on hard metal bleachers! ~Dove Hunting. My hubby, son, son in law and grandsons love it. The other grandkids love eating them. 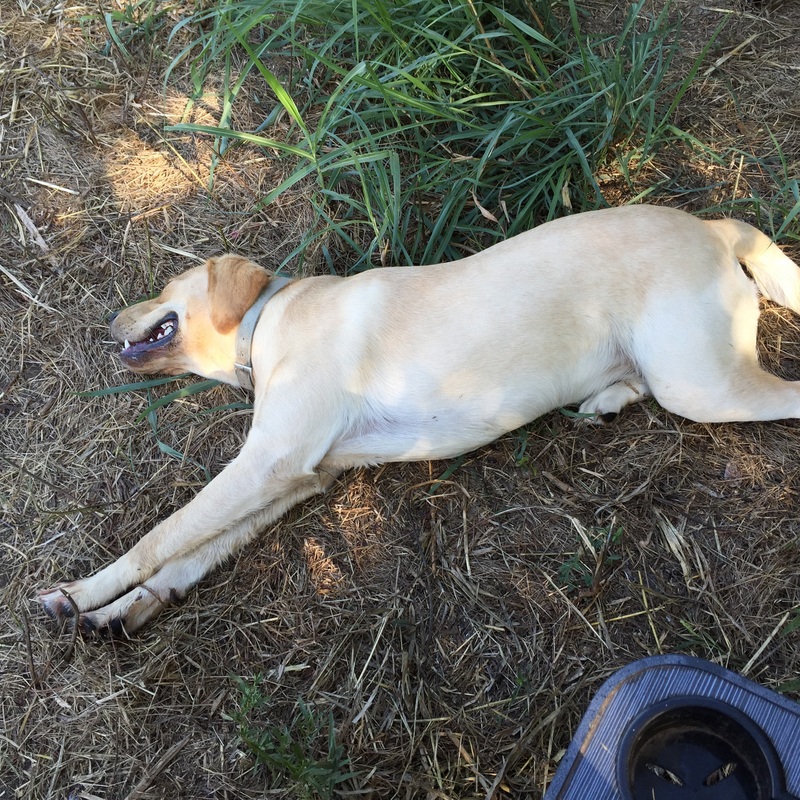 And Delbert, our 11 month old Lab, loves hunting with the boys. ~Cold weather comfort foods. There is nothing like a big bowl of chicken and dumplings or beef stew to warm your tummy and make you feel like everything is right with the world! ~Intense, nail biting, late season sports. It’s kind of crazy right now. The Rangers started the first half of the season really slow, but we are now in first place in the American League West. It’s getting serious. Plus, both NASCAR and NHRA are in the midst of “the Chase”. The chances of hearing loud and sometimes colorful language being yelled at the TV are very high! ~Bass Fishing. Water temps are starting to drop and the weather is just perfect to spend a whole day on the lake! ~Car Shows. Starting in mid September through mid November, there is a big car show or auto swap meet every weekend. Always a nice day date! ~Sweaters, jackets and blankets. I happily bundle up as soon as the temps fall below 70! ~Fall make up. I like wearing and experimenting with the darker colors and piling on the jewelry! I’m sure that I’m forgetting a few things, but these are my top faves! What are your Fall Favorites?? Delbert’s first hunt. He played so hard, he was worn plum out. But he did manage to retrieve one bird, so we’ll consider that a success!! I love Delbert’s picture! Fall is my favorite time of the year too. The leaves are changing, the air is crisp, fresh apple cider, and time to break out the sweaters! I laughed about bundling up below 70. We break out our shorts when it hits 50! I love reading about different areas and imagining what it must be like to be there. Enjoy your lovely fall! Thank You! Delbie is a mess, but he’s our baby! We really don’t get much of a fall, but I just love it being below 95 degrees! It was 72 this morning, so I had to go back in to put on jeans and grab a denim jacket!! I bet y’all have an amazing fall. Thank you for commenting! I’m so honored because I just love your blog!